Wired have just run a story about the salvage operation [^] for US Air Flight 1549. 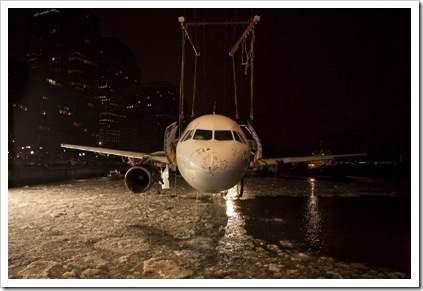 US Air 1549 was the flight that landed on New York’s icy Hudson River [^] in January 2009. Luckily all 155 people on board survived, mostly due to the skill of the pilot, Chesley Sullenberger, and quick thinking ferry operators. Interestingly only one photographer, Stephen Mallon [^], was allowed to take photos of the salvage operation. And as the Wired article points out, the release of even these photos was almost stopped by legal action.